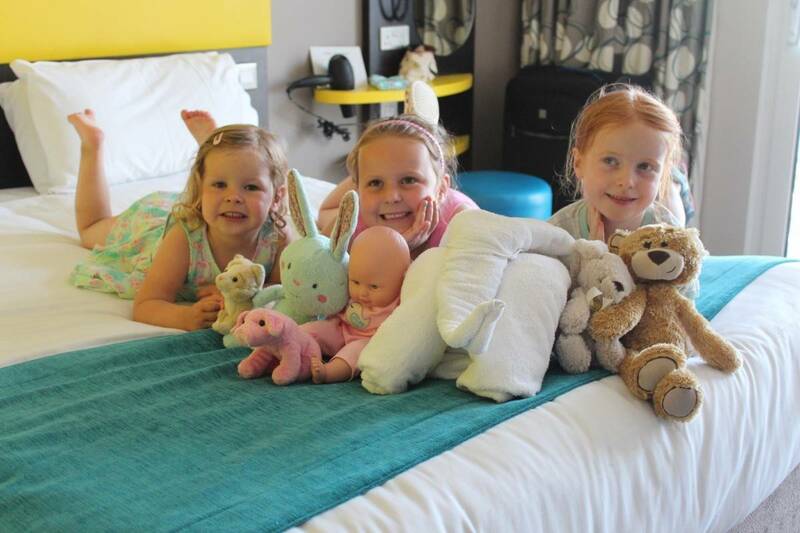 Just before we went on holiday last week LP and Little Man were sent a very special gift to take with them – Holibob Bear. He arrived with his suitcase and a letter explaining that he’d like to come on our travels as well as a blackboard to leave messages for the children and he had even brought activity ideas with him as well as his passport and a notebook to record his adventures in. The children loved Holibob Bear immediately – and I was also a little fond of him. He looked different to other teddy bears, with a pear shaped body that helps him to rest against you, sit for photographs and really just added to his character. The children abbreviated his name to Bobby – and wherever the children went, Bobby came too. 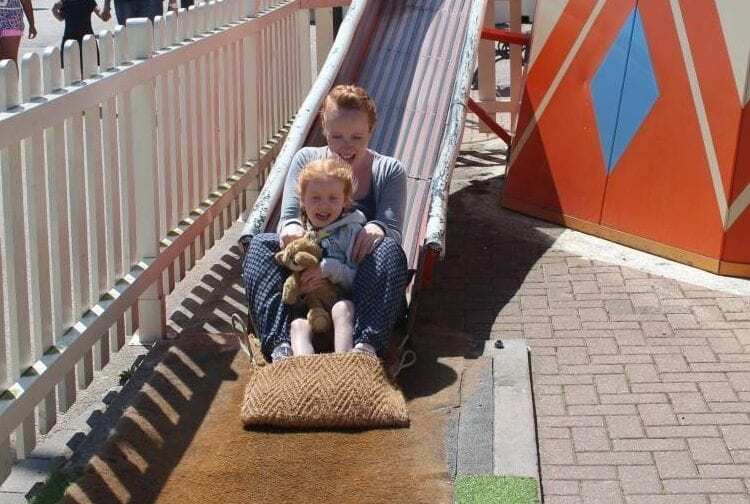 We spent the week at Butlins and Bobby loved his trip to the seaside. He didn’t mind the beach being pebbles instead of sand and loved throwing stones into the sea with Little Man, relaxing with cuddles or just sunning himself for a while. 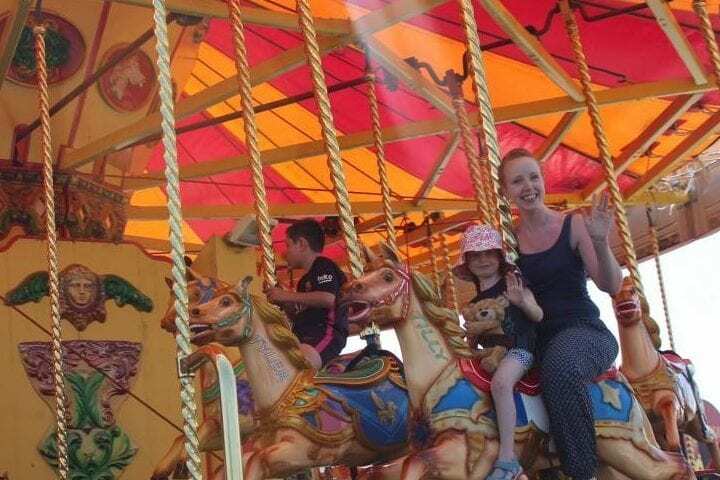 Bobby was taken on fun fair rides – loving the carousel and helter skelter. The children didn’t let him out of their sight and he loved being a real part of the family. Holibob Bear didn’t get scared on the rides and helped the children feel more comfortable and relaxed – whatever they were doing. Holibob Bear was the perfect travel companion – sitting with us at meal times, sleeping in the children’s beds at night and even sitting between their car seats on the journey – when he wasn’t being cuddled of course! LP and Little Man absolutely loved Bobby and since we’ve been home he has carried on his routine of sleeping next to them in their beds, being brought down for breakfast in the morning and even sitting with them at dinner. They are already talking about what other adventures they can take him on – and have already said that he’ll be coming on our summer holiday too. But, another great part of Holibob Bear is how, with the use of a basic card game. he can help children and their parents choose which activities to do on holiday or at home. 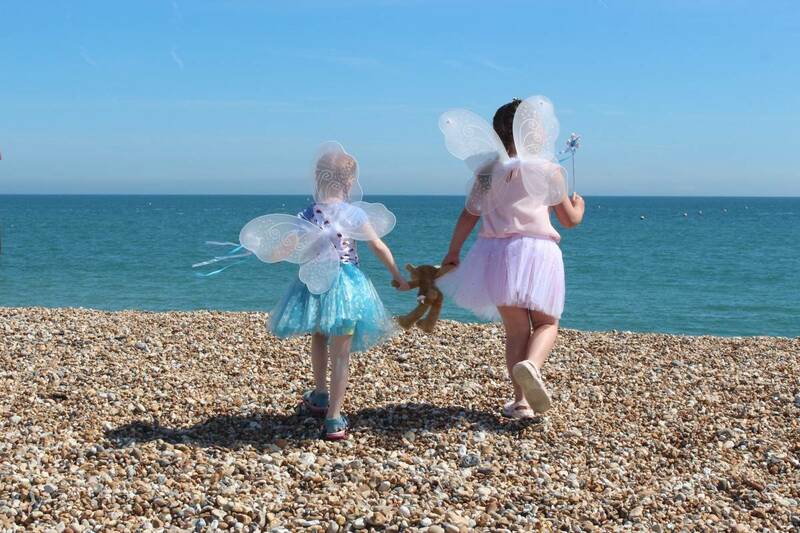 It would be great to let Holibob Bear help pick activities to fill the summer holidays – with simple things like going for a walk or visiting a museum to going swimming building a den or flying a kite. 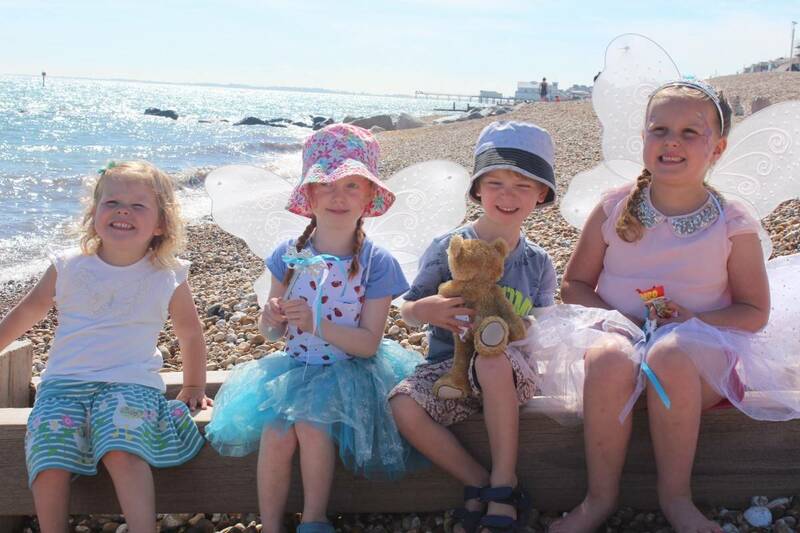 Holibob Bear will help any family find inspiration for things to do – and he even comes with stickers to put in his passport each time you complete an activity too! We have all loved having Holibob Bear with us for the past couple of weeks and it’s amazing how quickly a teddy can become part of the family. But, our Bobby is so much more than just a bear – he has so much personality and he is just so easy to love. He’s so different from traditional teddies and it’s hard not to smile when you see the children sharing their slush puppy with him or helping him build a sandcastle. The Holibob Bear Deluxe Pack has an RRP of £24.99 and Holibob Bear and accessories can be purchased separately. Check out their store here. We would take him for a picnic down on our local beach! I am sure he could help us build a sandcastle too and possibly paddle his paws in the sea! Aww he’s adorable, my two would like this too. I’m impressed you managed to persuade them to share it though, my two would argue over who got it at bedtime! Our first adventure would be taking it on holiday, hopefully to Devon at the start of the school holidays. We would take him on our holiday to the Lake District. Our family holiday to Florida. I would send him to Romania with the charity I support. The kids at the TB Preventorium would love him! We could take him on our holiday to lanzarote. We will take him to Tenerife with us on holiday. Will be such a great new friend for my daughter. Aww he’s so cute, I know a few little girls who would love him. I’m sure my girls would love to take him away with them on their holidays in the summer! What a brilliant idea – the Pawport is amazing! 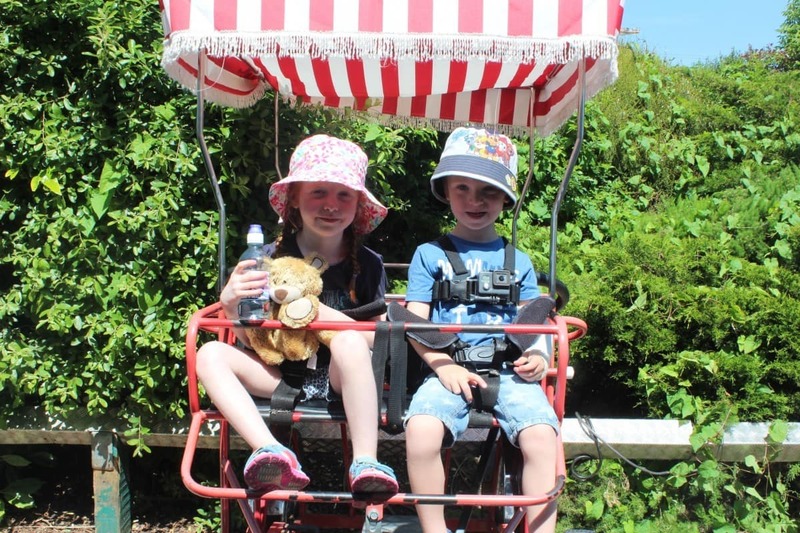 We haven’t got anywhere special planned for a day out yet, so Holibob Bear would be taken to the park for a ride on the swings with my two little ones. we would take him camping or na bike ride first! To our local woods, camping. our little Grandson would be taking him camping in west sussex! Holibob’s first visit would be to Stratford-Upon-Avon. We’d take it to our caravan holiday in Inverness! Our extended family holiday to the Marina in the Lake District. To the park, my daughters favourite place! Scarborough, we would take Holibob Bear to Scarborough’s beautiful beach, to build sandcastles etc. I would give him to my niece who is 18 months old. She can then take him on her 1st holiday. We would take him to Hawaii, then California, to see our friends there! It would be sooo cute in an hawaiian shirt! I think we’ll go on a picnic at Shibden Park near Halifax. To visit my parents in the summer. My daughter is going to be spending a few days on a sleepover with her grandparents so we can have some quality time so the Holibob Bear would help keep her company and make it easier for her! We would take him to our holiday to one of the haven caravan parks. I think a picnic in the park would be perfect. We’d take him Glamping in Hampshire! Going to the local park would probably be the first adventure. Our family holiday to Spain. The first trip would be to Blackpool to see the circus in the tower. His first trip would be next year when we go to South Africa on holiday to see the family. We would take him to his new owner Chloe and get lots of photos of her and him as we visit different places and picnics. He’ll be coming to our week long cottage getaway in rural dumfriesshire. We would take him to the beach with us. We would take him on our holiday to Cornwall. Thanks for the giveaway. He would be coming to Connecticut with us. We are going to visit my sister and brother-in-law, and he would have a lovely garden to sit out in (photos would be sent lol). I trip to Scarborough .. somewhere we have never been but have been invited to meet friends there, so this would be a great first trip. Funnily enough we are off to Butlins at Bognor Regis in August so we would take him there too! I think Edinburgh zoo would be our first stop! He would be my lucky mascot to keep me company on my fishing trips!